It’s October 25th. Halloween is a little less than a week away, my birthday is a little more than a week away and the first Dark Souls III DLC, Ashes of Ariandel, is available today for all the travelers of Lothric to discover and explore (I’m a huge fan of the SoulsBorne games, if you didn’t know). That said, one can expect I’ll be immersed in otherwise idle occupations for the next week or so, but that’s not to say I won’t be working on at least a few things, here and there. First, if you’re as big a fan of Halloween as I am, I hope you’ve been following me on social media. Since October 18 (the 13th day before Halloween) I’ve been posting a picture a day to count down toward my favourite holiday of the year. I know it’s nothing major–just a little fun thing to do to get in the spirit of the season. So, if you’re not following me yet, please do so. Social media links are at the top of the sidebar. 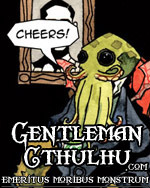 Also, I’ve been putting together a number of Gentleman Cthulhu comics in an effort to get a lead on the web-comic and ensure fewer delays. Though sometimes it’s two steps forward, one step back (as the saying goes), and I’m falling a bit behind again in an effort to complete a number of comics all at once. That said, I’m hoping this concerted effort will work, especially as I’m juggling a lot at the moment, and it seems I’m getting increasingly busier as time progresses. Other than that, the cover illustration of Chadhiyana # 5 is complete, though still no word from Rosarium Publishing on a release date. Again the issue was submitted back in July. Hopefully I’ll have something official from them soon, but until then, I can only ask you to continue to wait as patiently as I am. I suppose that’s all for this week, though the Dark Souls DLC does bring to mind that back in the Spring I had mentioned writing a series of pieces on the Souls series (including Demon’s Souls and Bloodborne). For those mutual fans of the series that were waiting in expectation for this, I can say that I still have plans to do so. Unfortunately, things on my end have just gotten perpetually busier as the months have passed since the IndieGoGo campaign Rosarium Publishing ran in March. Hopefully things will finally calm down for me in the meanwhile. Also, keep checking my Zazzle store for more products (zazzle.com/jmdesantis). Again, a number of new designs have been added and I’m working to put these (and even some of the older ones) on a number of products–especially with the Holiday Season just around the corner. And, if you haven’t yet, add your name to my mailing list. It more than doubled in size at New York Comic Con this year, and I’m trying to think of ways to add some value to it for my subscribers.